Peethi Ki Paronthi is a stuffed paratha with a spiced Urad dal filling. Paronthi is smaller and thinner than regular paratha. From the recipe I adapted, I read an interesting story on what a Paronthi means. Anyway, it is said that paronthi is smaller and thinner than regular parathas, and for many years ago, people were mostly having pooris or kachoris for all their meals. However, with health consciousness, these paronthis came about and these are equally good. Peethi refers to the Urad Dal filling. So basically you can call this lentil stuffed flatbread. My stuffing turned out spicy and coloured as I added more of turmeric and red chili powder. These really stay well as the filling is well cooked. The other dishes with Papad Parathas, Padvali Roti and different varieties with Palak. I almost thought I will make Pangi/Panki from Konkani cuisine. However, this recipe was again with plain rice flour and very similar to the Rice rotis I have shared. So for P, it ended up being a stuffed Peethi ki Paronthi in the AtoZ Flatbread and More, where I am doing AtoZ Indian Flatbreads. 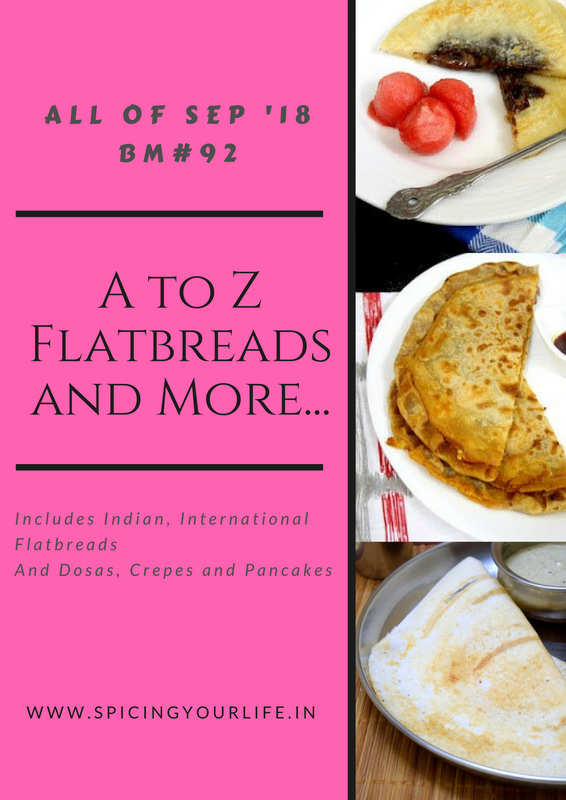 If you are keen to know whats for P in AtoZ Dosa Varieties, check my other site! Knead the flour with salt to a soft dough and keep it covered till making. Wash and soak the Urad dal for at least 30 mins. If you soak for more its even better. Drain and grind to a fine paste. Heat a pan with oil, add all whole spices and then spice powders. Add the urad dal batter and combine well. Cook till the mix is well cooked. Pinch the dough into equal balls. Divide the filling equal sized balls. Dust and flatten the dough, place the filling and seal it well. On a dusted rolling board, roll it to a 6 inch circle. Heat a tawa and cook on hot tawa on both sides. Sprinkle oil or ghee and ensure the paratha is well cooked. I personally loved it with mango pickle. Wash and soak the Urad dal for at least 30 mins. If you soak for more it's even better. Mango Powder was also added to the original recipe. These parothis are a close cousin of the Bedmi Paratha . We love these parathas which taste awesome and the pitthi tastes totally awesome after cooking . The combo of parothi and Sabzi is awesome and I would surely love to dig in ! I was recently advised to eat more urad dal….I don’t think I could find a more delicious way to begin. It looks so tasty and inviting….bookmarking! Wow, am in love with that urad dal stuffing, seriously am learning so many different flatbreads from you. Wonderful peethi ki paronthis there Valli. This looks like a spicy version of poli. And that urad dhal filling looks so spicy. This is a very new dish to me and it looks fabulous Valli. Looks like a healthier form of bedmi puris 🙂 Very interesting, Valli. Interesting information about peethi ki paronthi, we do make such things but hardly relate to the story behind it. A much thinner version of the dal stuffed parathas sounds good. Initially when I read the word peethi… it reminded me of the haldi we apply during weddings as its called pithi in Gujarati. Love this savory version of puran poli… awesome paratha recipe with curd and pickle. That is such a flavorful and healthy paratha and love the name of the paratha as well. This does not need anything on the side as the paratha is flavorful by itself.